As I prepared the Module 6 and Week 28 eCourse Lesson for the member of the Family Home Child Care Empowerment Club, I was inspired to share some of the tips with you! The topic of week 28 eCourse Lesson was: How to provide a healthy & Safe environment for infant/toddlers. The tips were provided in the form of a health & safety checklist, because I believe that the best way to improve your childcare program is through self assessment. 1. Maintain Ratio. Be sure that there is no more than four infant/toddlers to a care giver. It can be quite demanding for one caregiver to care for too many infant/toddlers. Moreover, infant/toddlers need lots of loving care and it is almost impossible for one caregiver to meet the needs of more than four infant/toddlers at any given time. ** In some cases, it is recommended that the ratios are 1-t0-3. 2. Be Alert of the Health/Safety Needs of the Children. For example: It is important that you or your staff know who feels well and who does not. Are the children adequately supervised? Know where the adventurous toddlers are, at all times,etc. Being aware of the health & safety needs of the children is a vital part of providing quality infant/toddler care. 3. Smoke Free Home or Center. You can almost assume that caregivers will be considerate and not smoke around children, however, it is very important that parents know that you have a smoke free facility! I suggest that you post a SMOKE FREE ZONE sign. Cigarette smoke is very toxic to a child. Moreover, if you have smokers on staff, it is also a good idea to require that they wash their hands after smoking. Furthermore, if your staff member(s) smell like smoke after a break; require that they change their clothes, before handling the infants/toddlers. Home Providers: Require that family members smoke outdoors during the hours of childcare. 4. Post the number to Poison Control. You may have already removed all medications and cleaning supplies out of the reach of the children. However, what if a parent fails to tell you that there is medication in a diaper bag and a toddler gets a hold of it? That’s right…you will need to call Poison control right away! So be sure to post your local poison control number near your phone. Here is the national number to poison control: 1-800-222-1222. ***Moreover, check diaper bags daily for medication,etc. 5. Small Toys Can Be a Choking Hazard!! If a small toy can fit through the opening of a toilet tissue tube, than it is a choking hazard for an infant/toddler. Be sure that toys that are 1 1/2 inches in diameter are kept out of the reach of young children (preferably under the age of 3). Infant/toddler learn about their world by putting things in their mouth and this is why you must be mindful of the toys that are within the reach of infant/toddlers. In summary, I hope that you have found this blog post to be helpful to you. Most importantly, My hope is that you create a High Quality and Safe place for infant/toddlers. 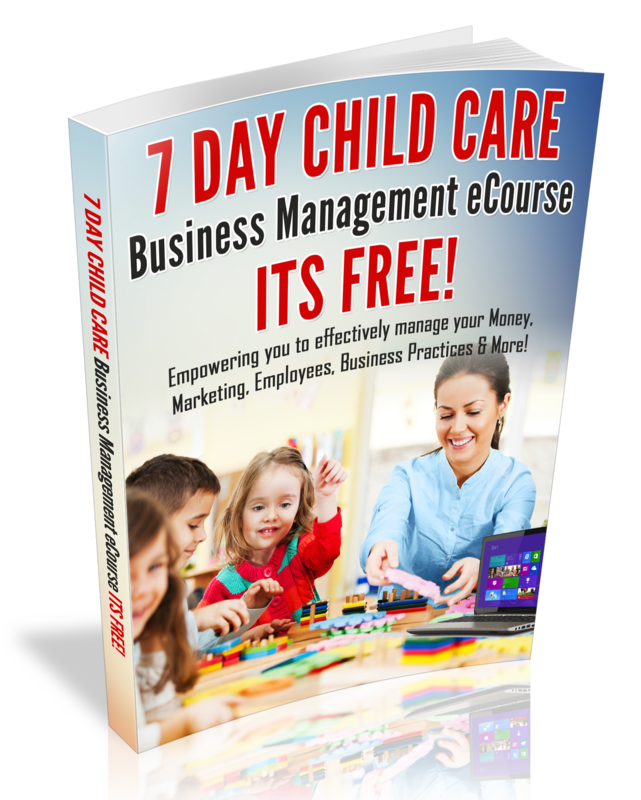 For more information about how to build a high quality family home childcare business (click here) or a Child Care Center (click here). According to the National Child Care Association Resource and Referral Agency, the first three years of a child’s life are a critical time of growth and development. High-quality care is extremely important for babies and toddlers, and increasing numbers of children are cared for by someone other than their parent. Early environments make a difference, and nurturing relationships are important for all children. 1. Physical Environment. The setting does not appear to be crowded when children are available; the environment is clean, in good repair and well ventilated. Also, there is a fenced outdoor play area for infant-toddlers. 2. Materials Available. The toys are appropriate for infant-toddlers and are within reach of the children. Equipment includes; cribs, high chairs, infant seats, child sized tables and chairs are available. You will find small riding toys, slides and a sandbox on the playground. 3. Low Teacher-to-Child Ratios. There is a low teacher-to-child ratio including: (Child Care Center) 1 to 3 for infants and 1 to 6 for toddlers. (Home Daycare) if the provider cares for infant-toddlers, there are no more than 6 children with no more than 2 infant-toddlers. 4. Daily Routine. The atmosphere is warm, supportive and children are never left unattended. The daily Schedule includes active/quiet play, naps, snacks, meals and meets the individual needs of the children in care. 5. Child Adult Interactions. Caregivers respond promptly to the needs of the children and you will see caregivers: holding, singing, talking to, reading to and interacting with infants-toddlers. 6. Training. The caregiver has training in child development and is CPR and first aid certified. 7. Parent Connections. Caregivers talk with parents about children’s daily routine and invite parents to visit at any time. 8.Licensing and Accreditation. The program is licensed by the state and is Accredited. If your program meets all of the above quality indicators above, CONGRATULATIONS! If not, don’t worry, if you create a plan to implement all of the above tips, you will be on your way to having a quality infant-toddler program. When I was in my home daycare, it took approximately 12-months to create a quality program. After I made the necessary changes and received NAFCC Accreditation, I saw the difference in the quality of my program. Most of all, the parents noticed the improvements to. Does your childcare Business meet any or all of the above quality care indicators? If so, please share your thoughts? 7 Steps to High Quality ChildCare- Free E-Course!